When I go for walks I always seem to find a lovely little stone to slip in my pocket along the way. I love the feeling of their smooth, happy surfaces in my palm and the feeling as I rub my thumb along their bumbly edges. By the time I’m done with my walks I know each pebble so well, I can never bring myself to leave it behind. That means I have a nice tall tower of pebbles by the door and I thought it would be lovely to spruce them up a bit. The first step is to gather your stones. I’ve picked some that have some sort of memory tied to them, it makes it easier to lovely them up with a design or pattern that reminds me of that memory. Wash and thoroughly dry each stone. 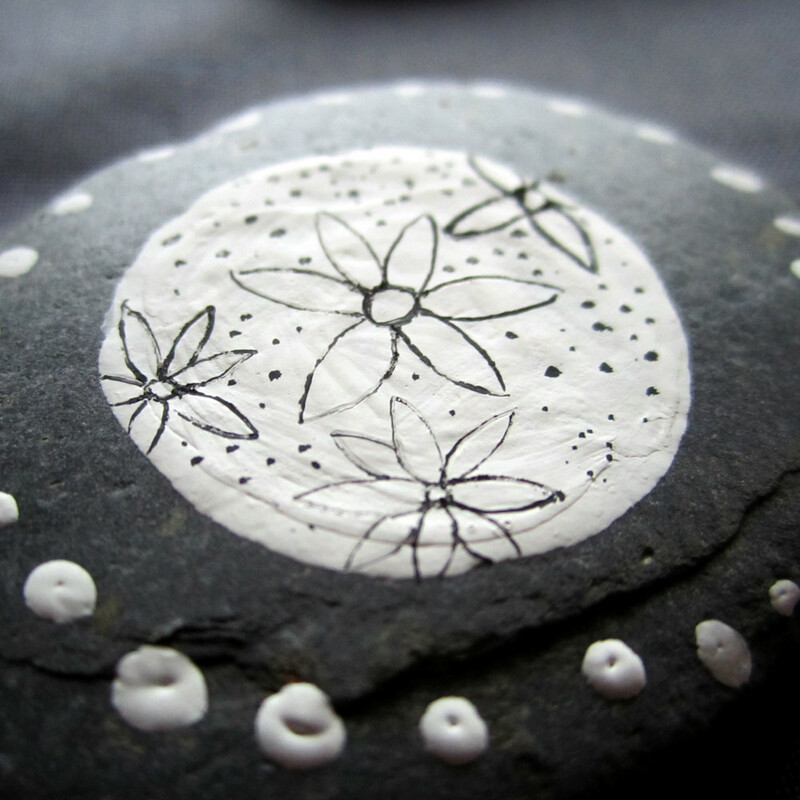 I started with plain white acrylic paint because I think it’s rather striking against the grey stones. 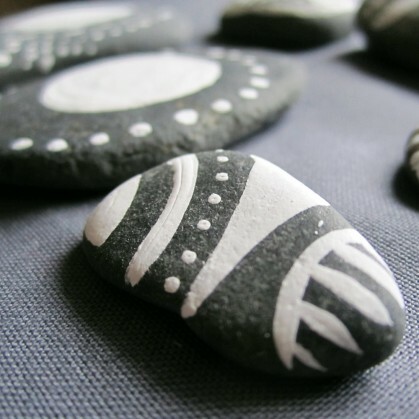 You can use other colors, however it would be best to have a layer of white paint underneath so that the colors pop… otherwise the grey of the rocks will dull the color down, no matter how many layers you put on. 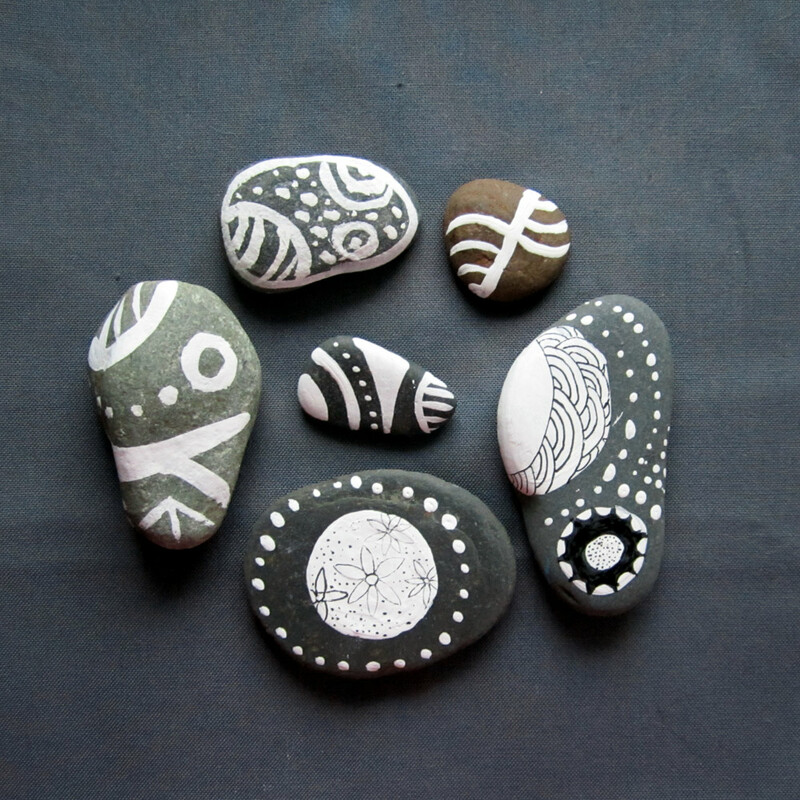 Each stone has their own particular quirks and tendencies. 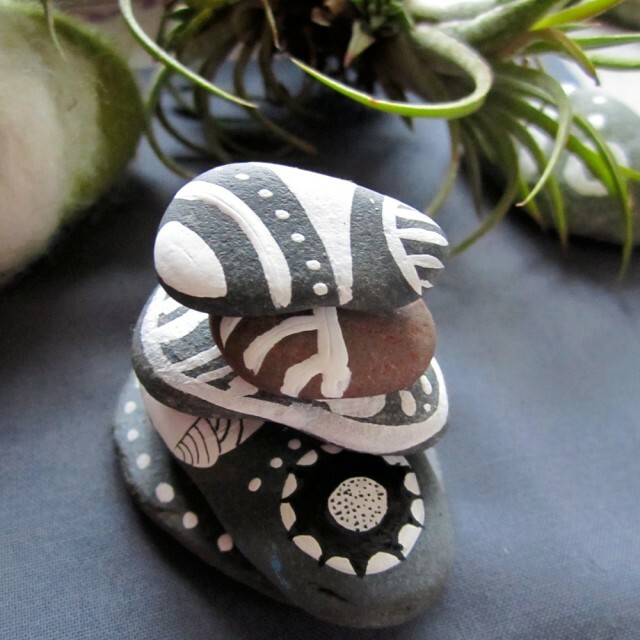 Find where the stone naturally wants to sit… does it want to rest on it’s end? The back? The strangely curved front? 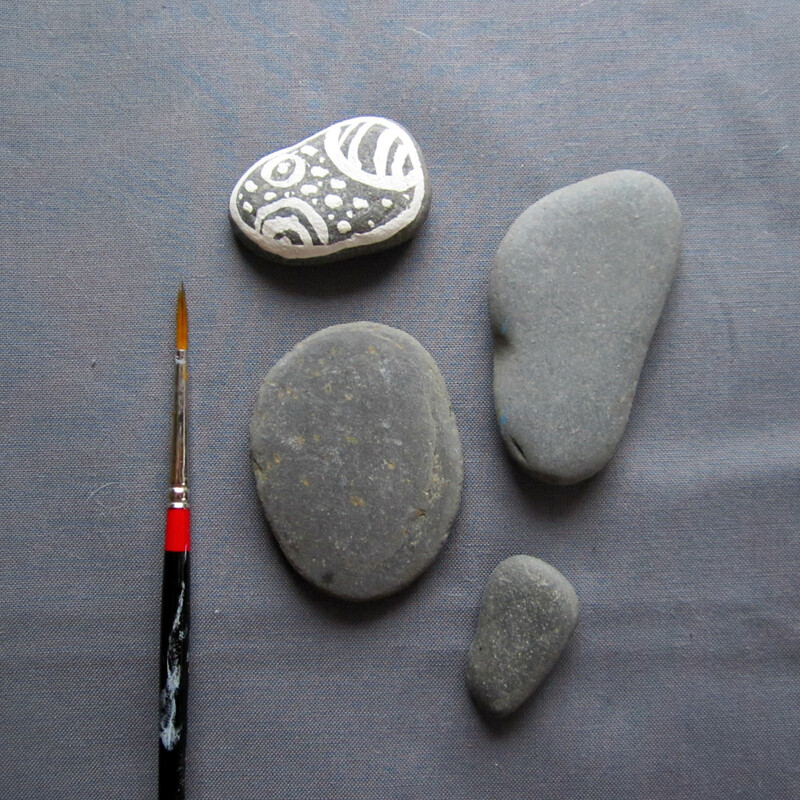 Once you’ve decided how your stone is most comfortable on your work surface, get your paint and paintbrush ready. I don’t have a mixing tray so I just put a dab of color in the lid of the paint container if I’m using the color straight from the bottle. That way it just goes right back into the container when I put the lid on instead of washing down the sink. After getting your paint ready, moisten your paintbrush so that you have a nice point. 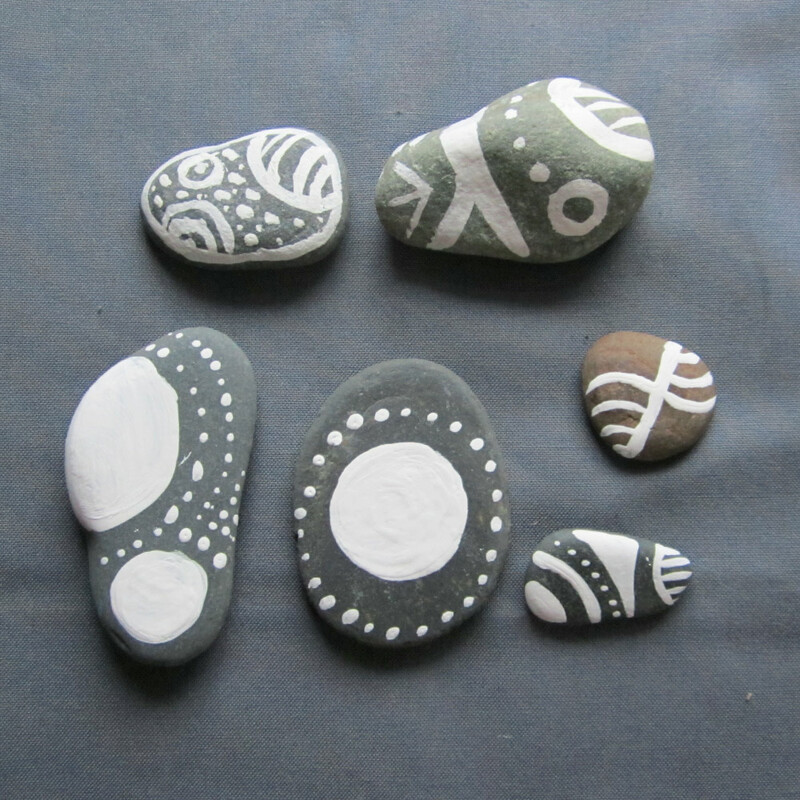 All of my stones seem to have a wider side and a pointier side… like stretched eggs. I like to start painting my design at the wider side and work my way to the pointier end. You can always use a pencil to trace out a design ahead of time… the paint will cover up any markings you make or, if you do something you’re not happy with you can always wash it off quickly, before the paint hasÂ a chance to dry. 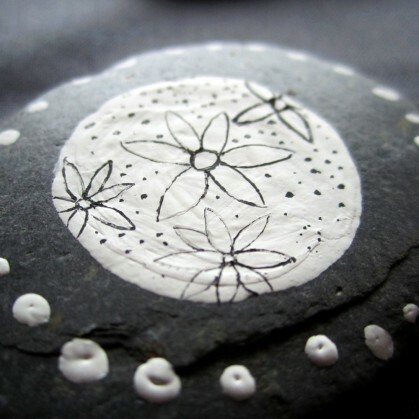 On one of my especially round, flat stones I painted a large white area because I knew I would want to draw a design with a black pen later. Keep the size and shape of your white areas in mind if that’s something you’d like to do as well. Let the first coat of paint dry for 45 minutes, then paint a second or third as needed making sure to let each coat dry in between. Let the stones dry over night to give the paint a chance to set up properly before you draw your secondary design in pen. I used both a Pigma Micron 01 and Pigma Brush pen for my designs. Again, you can use a pencil to outline any designs you want to make on you paint, the pencil should get covered by the ink so that it’s not visible. I used the Brush pens for the thick lines and to fill in large areas of space and the Micron pen to draw the more delicate lines in both designs. However, I would suggest that if you’re planning to do large areas of solid ink that you use paint instead. The ink tends to have a shinier, less even consistency than paint over large areas. When you’ve finished painting and drawing, let everything dry for about 15 minutes, just to be sure nothing will smudge. 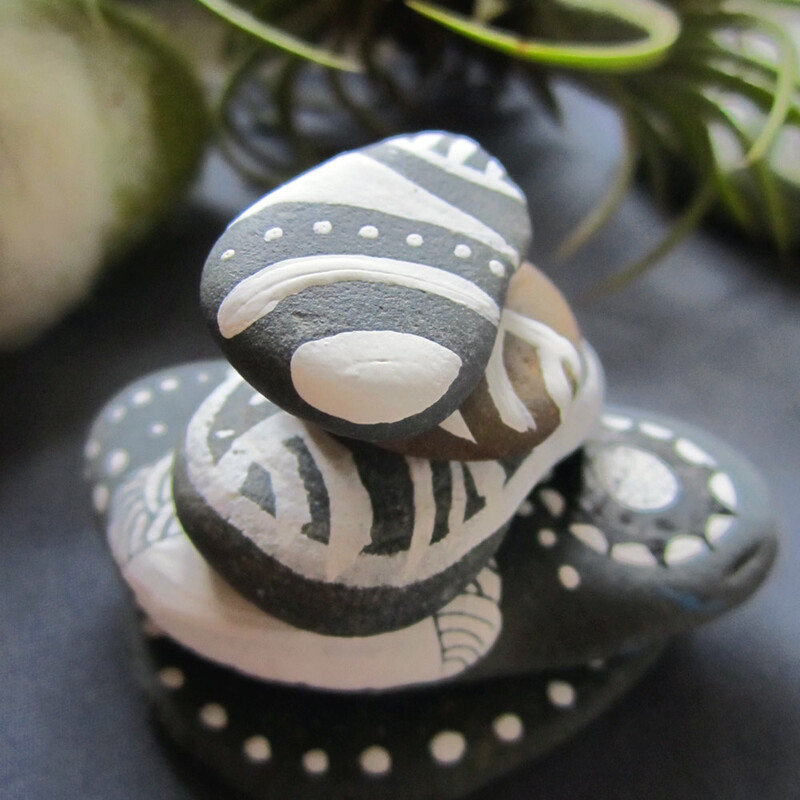 Now, it’s time to make a mini cairn! Stack them up from largest to smallest, somewhere you’ll see them everyday.